Happy Celebration Series day, friends! I hope you’ve eaten your breakfast by the time you’re reading this, because this week’s interview is likely going to make you hungry. And while that’s a super awkward thing to say, I think you’ll see what I mean after you’ve scrolled down to see some of these photos. The talented lady behind the camera (and the insanely delicious recipes!) 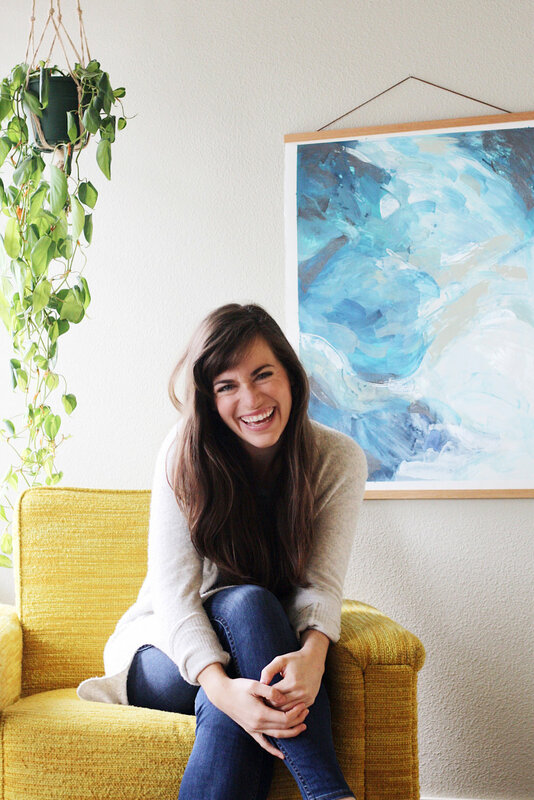 is Dana Shultz of Minimalist Baker, and I couldn’t be more excited to introduce y’all to her today! Dana and I met this past fall at a birthday party, and I remember spending most of the night quietly (and a bit creepily) wondering how a person could be so pretty. As we’ve gotten to know each other more since then, I’ve discovered that Dana is as talented, creative, witty and driven as she is lovely. I’m Dana Shultz and I’m the author of the food blog Minimalist Baker. I do all of the creative stuff —­ recipes, photos, blog posts ­ — and my husband, John, does all of the technical, businessy things —­ design, site optimization, product development + management, and blogger resources. I’m quite surprised to say this, because I never imagined myself making money doing something as creative as I do now. But I love the creative aspect of my job. I love that I get to develop recipes that my brain thinks of, make it with my hands, photograph it, make it look pretty in Photoshop, and then share it with our readers. It’s something I can’t imagine tiring of. A lot of times our readers inspire recipes with their requests. See examples of that here and here. Travel is also inspiring me. I’m still developing recipes based on food I tried abroad last year. As for people who are inspiring me, at the moment it has to be McKel from Nutrition Stripped. She has amazing recipes, is a beautiful person inside and out, and is truly helping people be holistically well. Also, her website design ­ — swoon! Okay, really though...get in my belly. Getting everything done I want to in a day. I’m very ambitious and think I can get more things done in a day than I actually can, even though I know that I do much better work and am more focused when I keep my task list to 2­-3 major things a day. I’ve also been struggling lately with getting distracted, but this podcast with Alex Ikonn on the Jess Lively Show has been helping me a lot with that. I especially loved the tips to set a time limit to complete each task, and then take breaks in between so you’re more focused for your next task. One time, Dana asked if I would taste-test her homemade vegan chocolate and it was the best day of my life. No one else is me. No one else thinks of recipes quite the way I do. No one else approaches photography quite like I do. Sure, there may be some similarities in my work and other people’s, but I rest assured in the fact that I am unique and therefore my work will always be unique. If I just listen to myself and create the things I’m interested in at the moment, that will always be fulfilling for me and (hopefully) interesting to other people. I'm drooling on my keyboard. Which Monopoly game piece was your go-­to? You can find more from Dana on her blog, instagram, facebook, twitter and pinterest. And trust me, you want to find more from Dana.